EUR/USD has slipped back into the 1.3150s as the market digests the latest US data. Retail Sales might not have matched the consensus forecasts but the headline was positive to support the US unit. The pair is yet to break back below the 1.3150-mark but further US unit gains cannot be ruled out and this will put the EUR/USD 1.3127 session lows and the support into the figure in view below. USD/JPY’s rally from 76 support stalled at 77.80, where the market ranged between that resistance and 77.50 support. As the 2/13 US session got underway, it fell below 77.50. The RSI in the 1H chart also fell below 40, showing loss of bullish momentum. We have noted the 77.30 pivot as a key level and if price can break below 77.30, and fall below the rising trendline, we should be seeing a slide toward 77.00. Below that, a test of 76.55 could be next. The market is inside of a range with resistance at 78.25, so any bullish outlook should be capped at this level for now. A break above 78.25 would be a strong bullish signal outside of the short-term. This can start with a failure to break below 77.00 and a break back above 77.80. Otherwise, below 77.00, we look at the 76.55 support, and then 76.00 again. 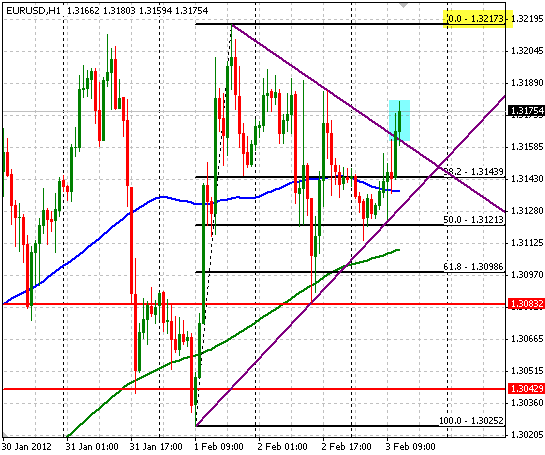 The EUR/USD has made a break higher through resistance,The next level higher is 1.32173.